The friday report can be relatively short, but not for lack of good food, no no no! On friday, we went out for humus, of course. (friday is humus day for many Israelis I think, at least it is humus days for my friends). And we went to one of the very best humus places there is (it is even number 2 on tripadvisor’s restaurant list for Tel Aviv, for a good reason): Abu Hasan! 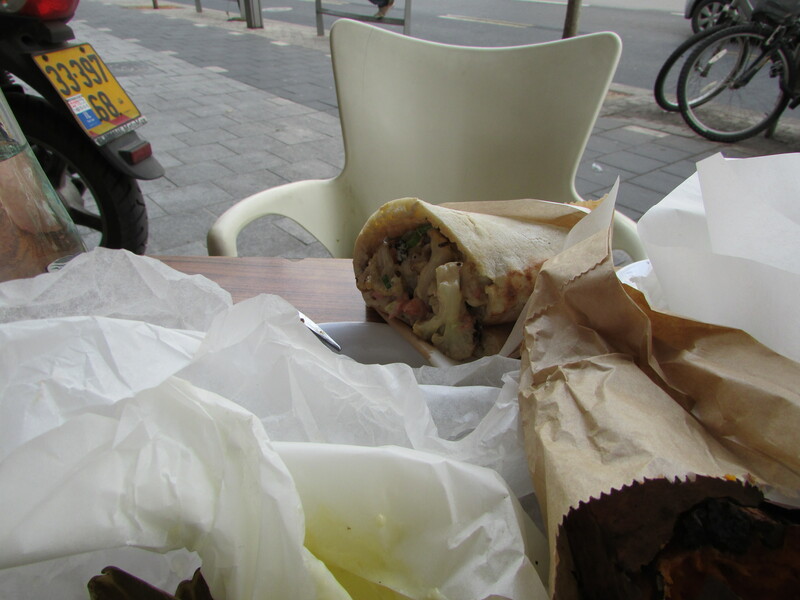 A small humus joint in Jaffa, which is legendary. Many people say it is the best humus there is (the recipe of course is a secret), and I cannot tell whether it is, for lack of research into other joints (my friends almost always take me here), but it is definitely the absolute best humus I ever ate. Ever. The problem that arose in this restaurant, that it is now also the best humus my girlfriend ate, and that means she can now actually compare my humus, to real humus. Up to our Israel visit, my humus was doing pretty well, now, I have to practice more. Anyway, a small place, be prepared to wait in a line (it’s worth it), you can also try the warm humus ‘masabacha’ or the humus with ful (broad bean paste), but I prefer the regular humus, with lots of tahina, served with raw onions (which I don’t eat) and some hot sauce. As said, its a small place, it is loud, hectic, chaotic. This is not fine dining at all, but it is the best dish made from only a view ingredients. And it, is a really really good reason to go to Israel. Did you know by the way that chickpeas make you happy? (look here). And hence so does humus? It actually does. It also makes you satisfied for a long time (I only got hungry around 8 at night, which for me is extremely unusual.). Yet again: go there, eat humus. And if not there, at some place else. After this lovely lunch, we did not have to eat for a very long time. Instead we made a little walk, to the old harbour of Jaffa, that is becoming a very trendy place, where you can get a good coffee, and sit enjoy a wine and look at the harbour (which is exactly what we did). At night, after our break at Jaffa harbour, where we enjoyed a bottle of nice white wine, we decided we might be a little hungry maybe, or let’s say, we could eat again. We took a bike (tel-o-fun, also recommended) and cycled to the other harbour in Tel Aviv, the renovated old harbour, basically, because we wanted to enyoj cycling next to the sea as long as possible. Which was amazing, because in the parks next to the sea, everywhere people, families where barbequeing, picknicking. The smell was fantastic, the atmosphere even better. Groups of young people, whole families, joined together in there weekend. No yelling, no extremely loud music, just many many people sitting there, talking, enjoying each other’s company and being relaxed. It made me so happy to cycle through this crowd, and not feeling uncomfortable one single time. In the Tel Aviv harbour, we went to the restaurant where we had breakfast the first day, because of the nice location (good view of the sea), and the nice service. We got the last table with a good view, ordered another bottle of white wine, and then several small dishes. 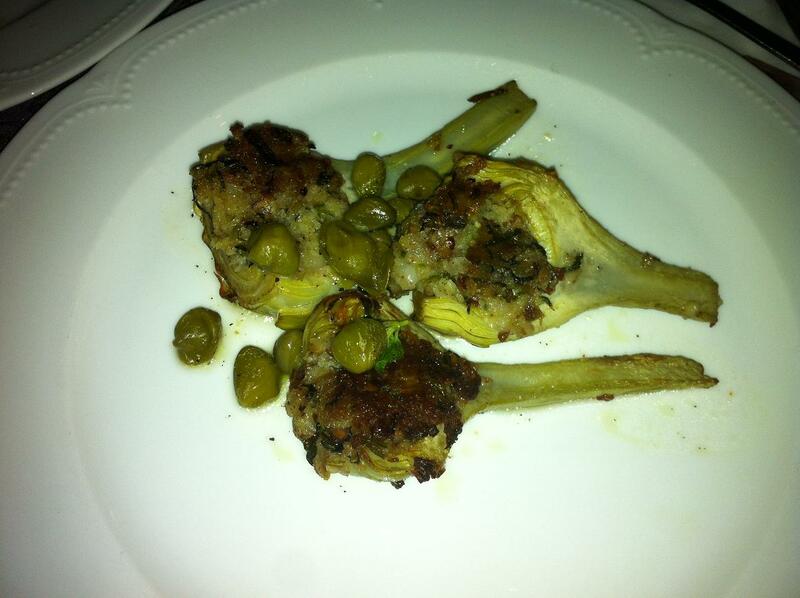 Of course, again, artichokes with grilled lemons. A bruschetta with grilled tuna and something else with something else (I forgot). All very tasty, all very fresh, made from good products. Not too much food, which was exactly what we wanted. This entry was posted in ate and tagged abu hasan, hummus, humus, jaffa on April 23, 2013 by esthercooks. On thursday, we visited Jerusalem. It was my second time to Jerusalem. We decide to take a guided tour from Tel Aviv to Jerusalem and back, through Egged Tours. I went with them the last time, so it seemed like a good choice. Well, let’s put it this way: next time, we will just go by ourselves. Nevetheless, we had a good time. Jerusalem is extremely interesting, overwhelming, impressive and exhausting. Unfortunately, we did not really eat IN Jerusalem (see below for some food pics), I guess that’s too much to ask from a guided tour. But instead, for lunch we went to a Kibbutz, namely kibbutz Ramat Rachel. I had no big expectations of a restaurant that feeds big groups of people all the time, and I was therefore very very pleased with the huge salad bar. They of course also had main dishes, warm courses, but these were indeed the usual suspects (i am of course not going to eat Schnitzel in Israel, sorry, but no, thanks.) that you’d expect from a cold/warm buffet. So, I decided to go for the salad bar, one huge table, with very nice, colourful, and as it turned out tasty salads and vegetables. I had hummus, lentil salad, something with grilled eggplants, tomatoes, artichokes, olives and probably more, but I cannot remember anymore. Almost everything tasted good. Fresh, not as if it had waited there for us for hours. Good choice for feeding big groups, really. After our trip to Jerusalem, we came back to Tel Aviv, just in time for an aperitivo. We got dropped of at the old harbour, which is completely renovated, with lots of nice restaurants and bars. And we decided to go into one of the first nice looking bars close to the sea: Julia’s. Unfortunately, we had to go inside, cause it got a little chilly. Still, a nice place, a bit quiet, but that was probably the time of the day. We drank a nice fresh fruity white wine. And after enough aperitivo and some 8 mails going back and forth between my friend and me, we were picked up for dinner for yet again, one of my absolute favourites in Tel Aviv, or rather, Jaffa: Haj kahil. I had promised my girl we would at some point go there. Ever after she read this, she also wanted to have her ‘cheese moment’. The cheese thing didn’t work out this night (but it did a few days later), nevertheless, the dinner made her (and actually all of us) very happy. 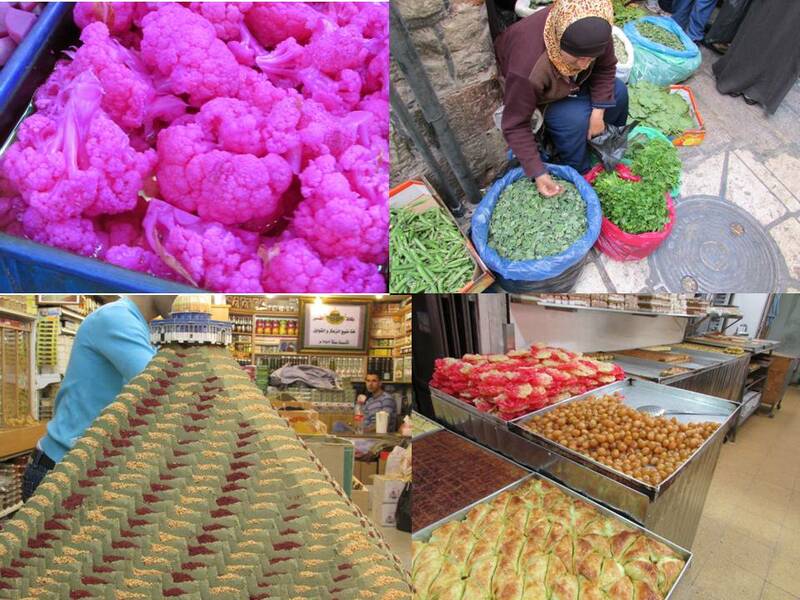 Haj Kahil makes traditional Arab food. They have beautiful lamb, chicken and several different types of skewers are also highly recommended. I suggest you only go here if you are really really hungry. Because here, I always feel pity for myself for not being able to eat more! Anyway, as for many Israeli restaurants, here too it holds that, even if this restaurant is recommended for its meat, it is a very good choice for vegetarians as well. Basically because of the starters, see the pictures. Usually, you start the dinner here with salads. Once you asked for this, within minutes the table is filled with at least 12 different small dishes (which will be replaced once empty), with the most lovely things in it. It is perfectly ok to just eat starters here (you then pay a little more for the starters than when you order a ‘real’ dish as well), and you will not leave the restaurant hungry. 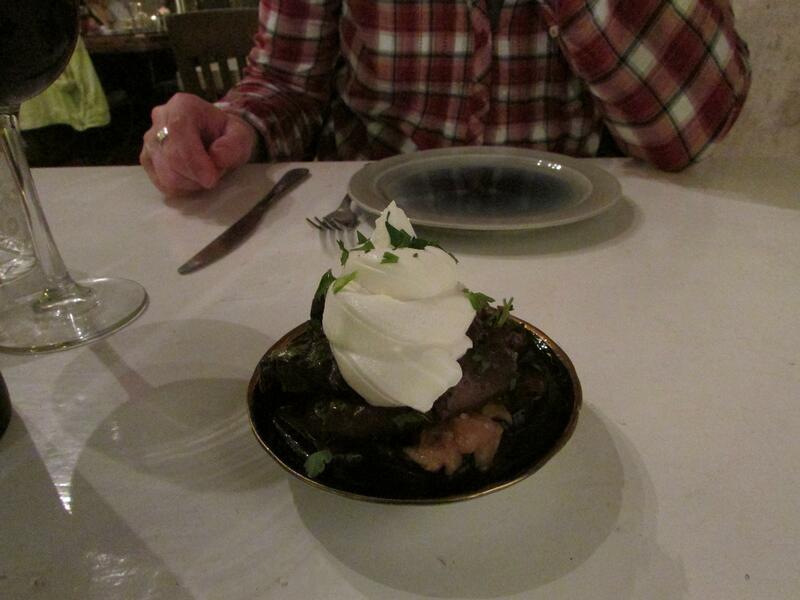 Nevertheless, we also ordered hummus, and a siniya with tahini, which is, basically minced lamb cooked in tahini. On the pictures you see a selection of what we got: an avocado spread, a beet salad, baba ganoush, hummus, a carrot salad, spicy eggplant, tomatoes with cheese, cauliflower in tahini (did I mention I now LOVE cauliflower? ), something with lentils, a salad with fresh apple and ginger, lebaneh, a potato salad, tabouleh, something green and spinach like (but not spinach), a green salad and a huge flat bread, with za’atar on top of it. Oh and to go with it, we drank fresh lemonade, and pomegranate juice. This is just a really absolutely great. Service is nice, quick, friendly. The food is fresh, all the different small dishes with so many different tastes, is a lot of fun too. And as said, I was sad I couldn’t eat more. Oh and I alsmost forgot the siniya: even more tahini: juicy minced lamb, with a tahini sauce. I like it a lot, but I suggest not ordering more than one portion, cause it is a little heavy. Haj Kahil, I would say: this is a very good reason to visit Israel, Jaffa. 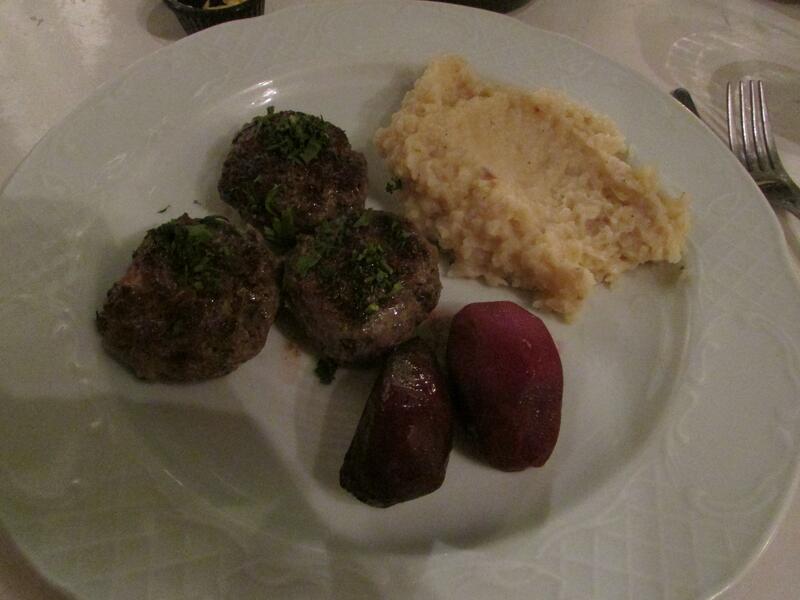 This entry was posted in ate and tagged haj kahil, julia's, kibbutz ramat rachel on April 15, 2013 by esthercooks. Wednesday was a long day of working at the university, and therefore we did not have lunch ‘downtown’ but at the university. This may sound like a terrible thing, but honestly? I wish I had a cafetaria like that at my university. They serve great coffee, several different kinds of fresh juices, made while you are waiting and according to your taste. Other than that, cakes, sandwiches, some warm dishes and they have a great salad bar. Everything is vegetarian, everything is fresh. I don’t understand why we can’t have that at our place. Sure there must be a market for something like that? Anyway, in the morning I had great juice, for lunch I had a stuffed pepper on lentils and well, basically ‘other grains’. Of course this was no ‘haute cuisine’, that was not the purpose. It was however, well made, fresh, tasty, and one could really notice that the owners like their jobs. On top of that, service was very nice too. Funny, friendly, with a little chat for everyone. I want a place like that too, here, every day. Please. At night after a long, intense and productive day of work, we decided to take a relatively early dinner (early for Israeli time) and we went to noah’s bistro, a restaurant that I visited once before, quite some time ago, and that is recommended by my good friends. Relatively early, cause the day after we planned to visit Jerusalem, and for this, we were gonna be picked up at 7 or so. Way to early in any case. 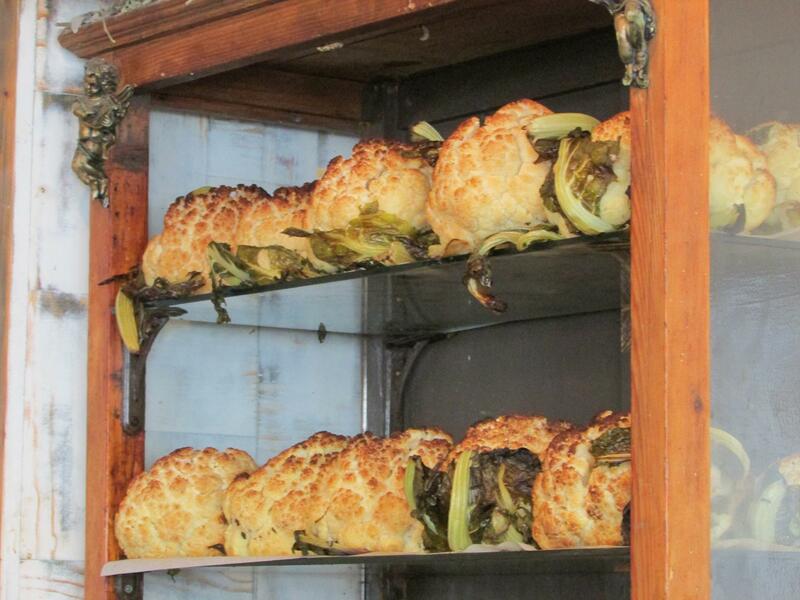 So to Noah’s in Jaffa. I guess you kind of have to like this kind of restaurant. I do, but I can also see why people don’t. It’s decoration is very alternative. Some would say, the place looks run down. The restaurant is owned by someone who also owns Cordelia, which is just around the corner, and decorated more classically, so if you are not into funky decoration, go to Cordelia, where the food is great too. This being said, we had a very nice dinner here. We were served by Amy Whinehouse, who was new to the place, which was no problem at all. She took her time, was friendly, and very helpful. We had a nice bottle of Israeli red wine, and again, I forgot where from and what name. Sorry. We started with sharing some small starters: burned eggplant with lebaneh. Good combination I have to say. But, I still like eggplant better unburned (difficult in Israel), I am not such a big fan of the burned taste. 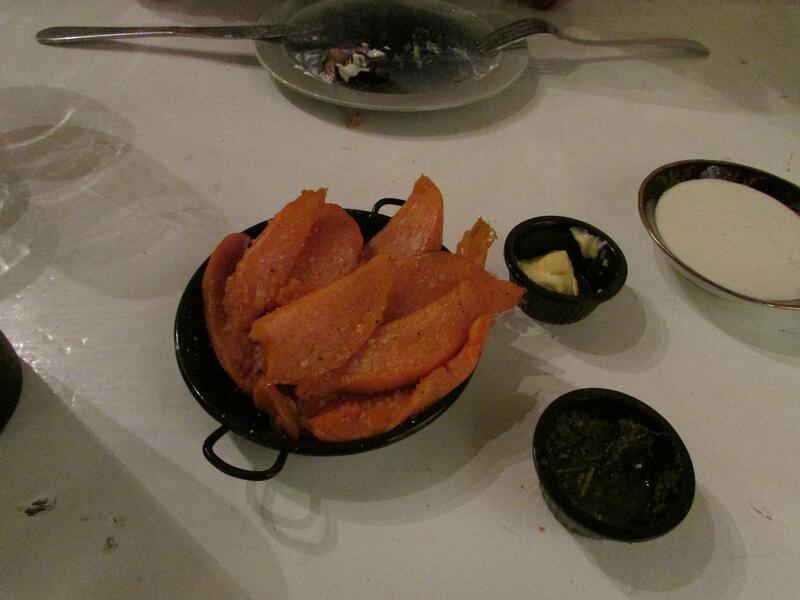 Then, fried sweet potatoe with coarse sea salt. Very colourful, very tasty. 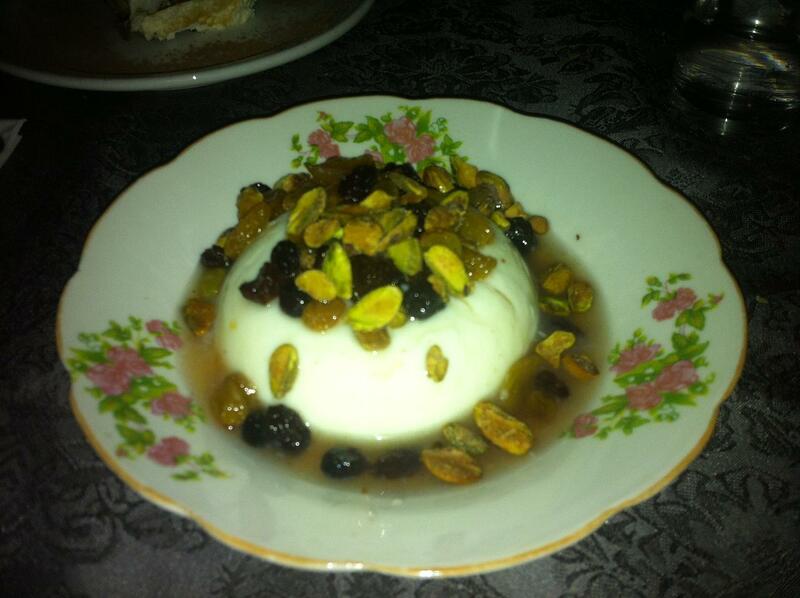 My girl then made the excellent choice of the tortelini filled with tahini with hyssop (za’atar) and tahine sauce. Obviously absolutely not italian, but really an extremely good dish. And again, so beautiful! (see below) And again: a vegetarian’s heaven, really. I instead choose a non-vegetarian dish for once. Meatballs, filled with cheese. I was a little disappointed. Not that it didn’t taste well, it did. But, to my taste, it was a little too heavy, which was a pity after all the fresh and light food I ate here. The meatballs were very well done, the combination with cheese worked well, but what was this huge pile of mashed potatoes doing on my plate? (nice mashed potatoes, true, but hey, we’re not in Northern Germany here). After this my girl made sure we also got some desert, a creamy chocolate thingy, sweet, nice, but too much for me unfortunately. All in all, a nice place to go for dinner, but I would stick to the fish and/or the vegetarian dishes here. Or simply order meat(balls) with vegetables only, I am sure they will not be offended. Not necessarily on the absolute top of my list for Tel Aviv, but I sure wouldn’t complain if someone invites me to go there again. 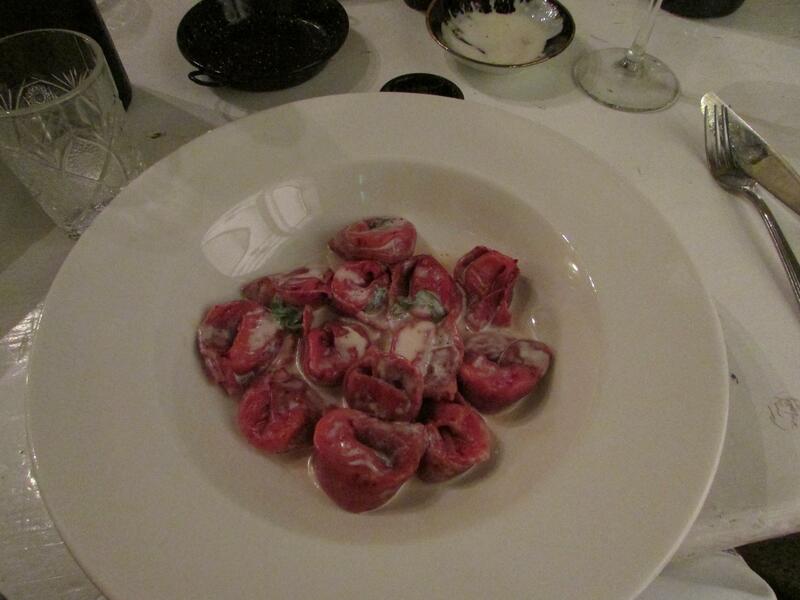 This entry was posted in ate and tagged noah's bistro, tahini tortelini, tel aviv on April 12, 2013 by esthercooks. Tuesday, second day in Israel, sunny and warm (over 30 degrees). After a very interesting and moving visit in the hospital (I joined my colleague who tested a patient on her language and memory after a brain operation on a tumor, and although it was in Hebrew, I understood quite a bit of what was going on -i knew the test materials- and that was very interesting! Extremely sad story for the young lady though, I sure hope she will get better), we went out in the sun to Miznon. A small chaotic, loud and crowded place, opened by a former chef. It is actually a pita place. Almost everything is served in a pita, which sounds as just another fast food restaurant. But: it’s not. The food is delicious. We had some starters, including a whole cauliflower which came from a wood oven, as well as a sweet potatoe (probably from the same oven). Simple dishes, but great products and treated well, hence very very tasty! I thought I didn’t like cauliflower all that much. Well, I was wrong. The way they make it, it is light, crunchy, slightly nutty, and not the heavy overcooked version I knew. Apart from that, we each had a different pita. Funny, on tripadvisor Miznon is recommended for its meat pita’s. I can’t comment on that. We all had a vegetarian version, and they were all great. One was with cauliflower, one with bread beans (I thought I didn’t like those either. Again, I was wrong), one with ratatouille kind of filling and one with vegetables that had been grilled before. So Miznon, recommended for vegetarians as well! These people really know what they are doing with their products. I will most certainly go there again. Our fourth Israeli meal was in Joz ve Loz, one of the restaurants that I visit on each Tel Aviv visits, which says enough. It is not cheap, but -to my western european standards- also not overpriced. The restaurant itself is decorated more or less as a normal living/dining room, with a mixture of old furniture. The same holds for the terrace, a funky mixture of old chairs and tables which creates an intimate atmosphere. It is always crowded, if you really want to eat there, make a reservation so that you won’t get disappointed. Service is nice, and very informal. 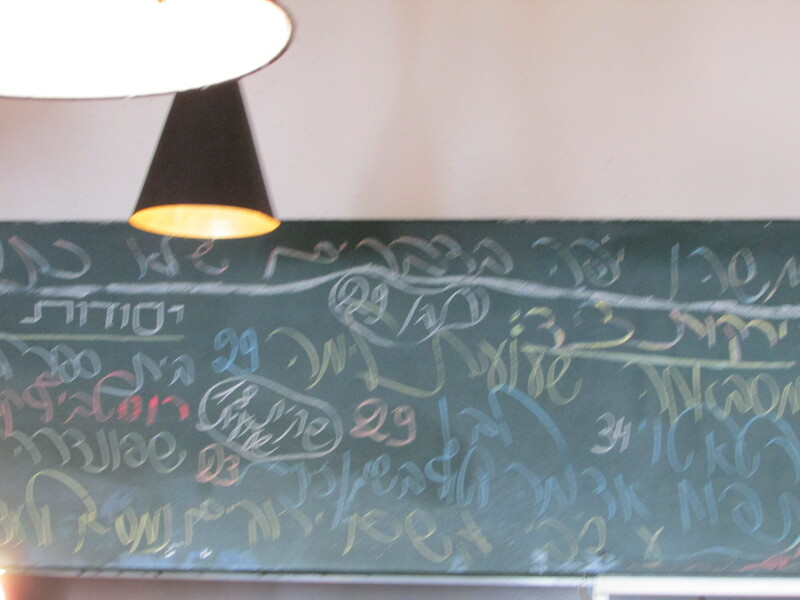 O, and yes, the menu is in Hebrew only, we were there with Hebrew speaking friends, so no problem, and I read on tripadvisor that waiters are happy to explain what’s there. Also be prepared to make more than one choice, since some of the dishes are out when you’re a bit late. I actually like that, cause it means that everything is bought fresh, and not too much is bought and then later thrown away. Anyway, another very very nice meal. Here too: fresh ingredients, combined in unusual, but extremely tasty ways. I had fried artichokes with capern as a starter (i have to eat more artichokes honestly) , and then actually another starter, chevice (don’t remember what fish, a white one :-)) with olive oil, lemon and fresh green almonds. I had choosen it because of the raw fish (hmmmm so fresh, really great) and the green almonds. These were interesting, a little bitter, but, I didn’t think they had much taste. Nevertheless, interesting combination. Of course, I tried other meals on the table as well, including a huge green salad (good), a pasta (spicy), filled squid (very nice, I would eat those next time if they have them) and for desert malabi with rose water and pistache nuts, sweet but not too sweet, one of my favourites. If you are in Tel Aviv, and have time for more than one meal, go here as well. 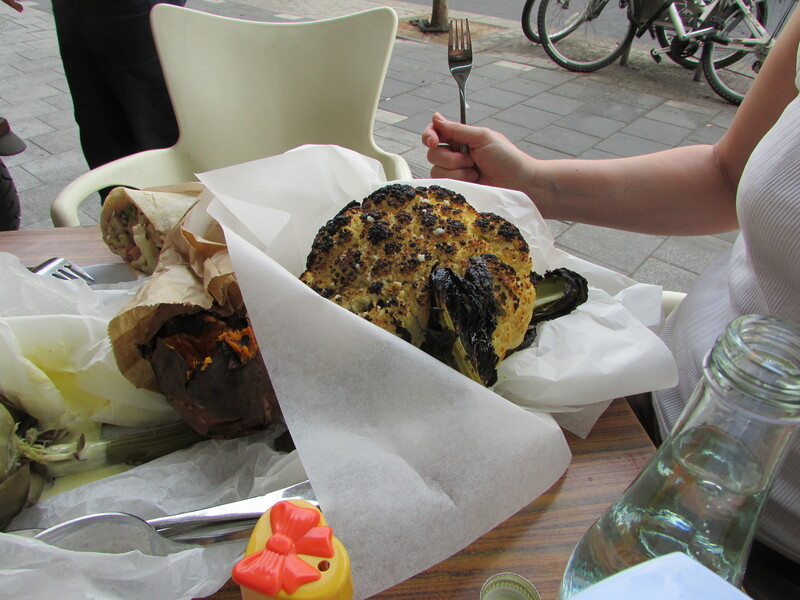 This entry was posted in ate and tagged cauliflower, joz ve loz, miznon, pita, tel aviv on April 4, 2013 by esthercooks.